You read that right - not fruits. One of the bonuses of driving along the Routes Nationaux and Departmentales (apart from the self imposed diversions) are the eating places. Whereas on the Autoroutes you get the roadhouse/service station standard fare, on the smaller roads you get a wide and varied choice - every option in fact, because because the roads often pass through towns, villages and hamlets. There are other places to eat, and these are usually announced by a piece of cardboard/wood by the side of the road with the word "frites" handwritten on it. They are one man operations in a caravan, sometimes in an aire de repose (rest area) sometimes in a layby (or parking) right by the side of the road, or like this one, down a side track in the forest. We stopped here on our way back from Nemours a couple of weeks ago. It was hot and we were in need of an icecream and it seemed the perfect place - shaded by big trees, and just far enough away from the road for the noise to be slightly muted. 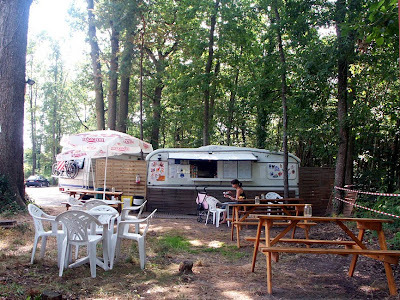 I had seen the "frites" sign the previous time we had been to Nemours, and remember seeing the caravan. Why do the signs always seem to say "frites"? We have no idea why frites is the foodstuff by which the places first announce themselves, because they do slightly more complicated food as well - even pizza (probably from frozen), steack haché (ditto) and hamburgers. For our first experience of this sort of dining we had just a drink and an ice cream. Next time we may be more adventurous. Mes Noisettes ne sont pas bonne ! My nuts are no good ! 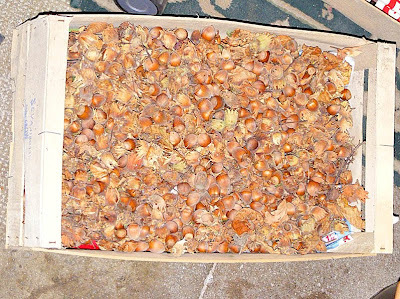 I've just started harvesting the billions of hazelnuts we have on our 6 noisetiers. On my way back from the orchard with a bucketful, I ran into one of our neighbours. She picked over the top layer of my hazels and pronounced virtually all of them pas bonne. I asked her how I could tell which were good. Sometimes it's perfectly obvious - if they have a petit trou, then they've been weevilled and there won't be a useable nut inside. Mostly though I have no idea how she could tell. She was right every time we cracked one to see whether there was a nut inside or not, but the good shells look exactly like the bad ones. We discussed it a bit, but it seems she just knows and I will just have to learn by experience. She tells me that it's been a bad year for hazels all over France. Her brother, who lives further north, has had the same problem, with many nuts being empty of kernels. Apparently I must leave them to dry out for some weeks before tackling the task of cracking them. It's time consuming and surprisingly hard work, so if the resulting nut count is meagre it will be depressing. A mixture of Williams and Beurre Hardy. 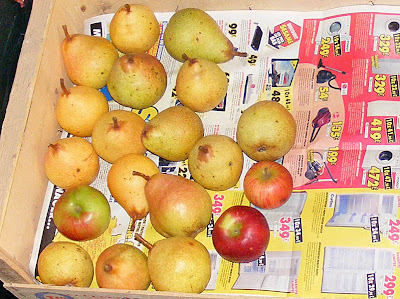 I've also picked almost all of the pears. It was that or lose them to a woodpecker (I think) who ruins them by pecking into and eating about a quarter of a pear, knocking them to the ground in the process. Every day for the past week or so I've found three or four pears in this state. 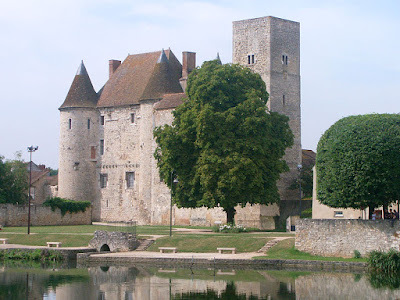 There is a pretty little village, off the beaten track for us, called Monthoiron. We only go there on our way to Brico-Depot in Dissay, but one day we should really take our time and visit properly. It bills itself as le Portail à l'Acadie poitevine. 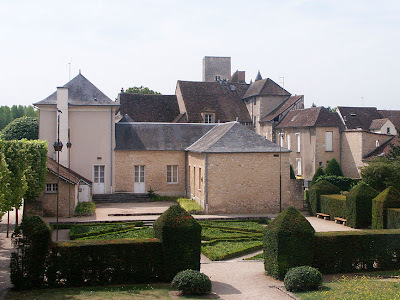 There are many places in the nearby département of Vienne, between us and Poitiers which have strong connections to the early French settlements in North America. The US state of Maine and the Atlantic coast of Canada (New Brunswick, Prince Edward Island, Nova Scotia) were once Acadie and many of the farmers who lived there came from around the little towns and villages in the central west of France like Pleumartin, Archigny and Monthoiron. In the 17th century, England and France jostled for control of Acadie. Many Acadiens fled – some south to Louisana, where they became the Cajuns, some back to the districts in France that their families came from. It is a sad and romantic story which has captured the imagination of songwriters and historians. A good outline of the story and its background can be read on Wikipedia (in English). 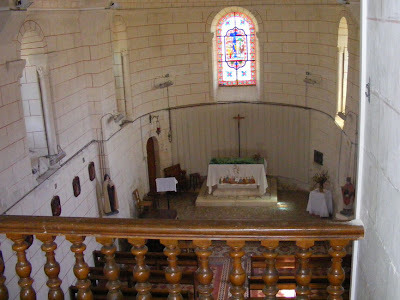 Inside the church, looking up to the gallery. 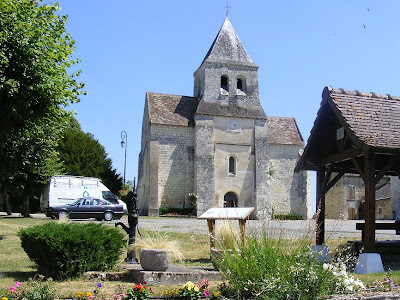 Even without this interesting historical connection to feed the imagination, Monthoiron is a particularly attractive village, set overlooking the lush prairie land of the Clain River valley. The church, on the market square, is absolutely fascinating, with some unusually good polychrome statuary and a sloping gallery which we think may be unique – we've certainly never seen anything quite like it before. There is an array of benches that you have to climb over to get a seat in any but the middle row. Did only the men sit up here in times gone by when women wore cumbersome skirts and weren't supposed to show an ankle? The excellent leaflet (in French) available at the entrance to the church explains that during the Wars of Religion in the 16th century, the nave of the church was destroyed and never subsequently rebuilt. 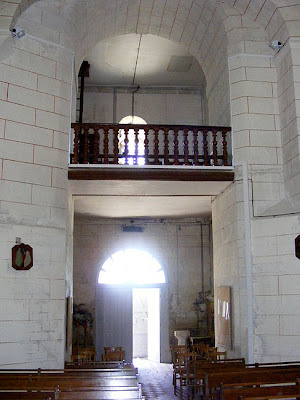 Due to the disappearance of the nave, one enters the church directly at the transept and immediately beneath the bell tower, with its massive pillars. The considerable height of the tower is obscured by the gallery built in the 19th century to overcome the lack of space. The freezer arrived yesterday, so after letting it settle in we turned it on and loaded it with the fruit we have processed since taking over the potager/verger. All you can see in the following photo is fruit based (if you're being a pedant and calling tomatoes a fruit, which they are), or fruit and veg based (if you're normal). Somewhere in there are 10 dinners worth of Pasta sauce for two people, the rest is cherries, nectarines and plum based produce. Plums, pears, apples, nashi and tomatoes you can see easily. 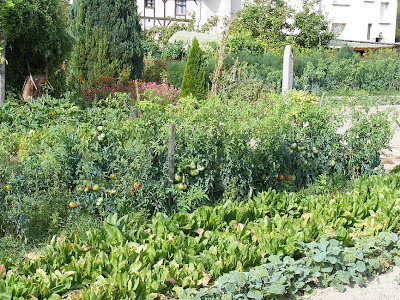 Below them are haricots verts, lettuce, chillies, aubergine, courgette, cornichon, hazelnuts and nectarines. When we got home I picked another 6 or 7 largish tomatoes from the front garden. If we aren't careful we are in danger of eating healthily. Mangling language is not just one way traffic. For every occasion where I may have told someone that I am an aspidistra, or Susan tells someone she loves him (rather than his work) , the French manage to amuse us with their choice of words. When you start a business, the business name is all important. It tells the world what you do and how you approach the job. 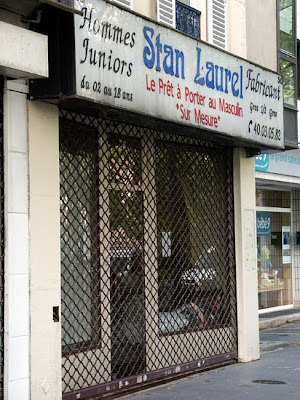 In the UK, the most notorious businesses for punning shop names are Hairdressers - and in France things aren't that much different. 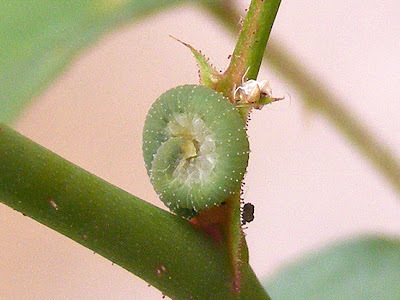 Yesterday morning when I went out to the boulangerie I noticed some cute little caterpillars, curled up asleep after a hard night's chomping on one of my rose bushes. 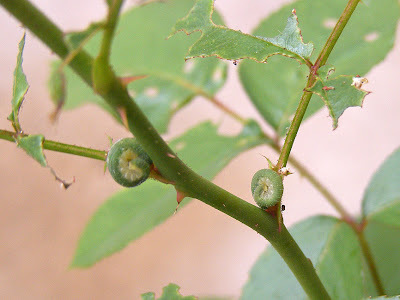 I haven't encountered this species before, but a little research on the net tells me they are probably Curled Rose Sawfly Allantus cinctus (Tenthrèdes du rosier) larvae, which means they are not caterpillars at all, but fausse-chenilles. The 'false caterpillars' will transform into sawflies, a group of stingless flying insects related to wasps. Many sawflies are serious horticultural pests, and a colony of larvae can consume the host plant in days. My rose seems to only have three individuals, so for the time being they can stay and take their chances on being snapped up by a bird with a late brood of hungry youngsters. PS The freezer did not arrive yesterday. We got a phone call to say that, malheureusement, it was not possible to make the delivery yesterday, and it would now be Thursday. If sanding an old piece of wood, don't try to get all the paint off. Really - it doesnt matter. Those shutters have seen many years of service and are proud of their battle scars. A patch or two of old paint underneath 4 coats of new stuff will make no difference. Remind yourself you're not sanding the latest coat of paint off, just scratching the surface so the new paint can take hold. Remember to dilute the paint. When putting on the first coat of colour, put the paint in a container and add a splash of dilutant. It goes a lot further and is easier to use. Don't keep sticking your hair in the paint. It doesnt help. Even if you're leaning back to look at your work, rubbing your hair in the last bit you painted really doesn't help. Remember the last time - and the time before that - when you painted window frames? You kept on grabbing the piece you had just painted so you could lean further out. Don't get hung up on the odd brushmark. Don't put the lid of the tin on the floor. Remember last time you trod on it? It wasn't fun then, either. There are no prizes for who can lift the heaviest paintbrush. You ALWAYS put too much paint on the brush, and it always gains weight as you go. Don't start work too early - the paint wont spread. Don't paint in the full sun, either - the paint will go all tacky before you can get the next brushload on. Don't keep "just" touching it to see if it's dry yet. It isn't. It's probably time for a beer. We have 3 plum trees and 4 Nectarine trees in the verger. The fruit on two of the nectarine trees ripened quite early - about 4 weeks ago. 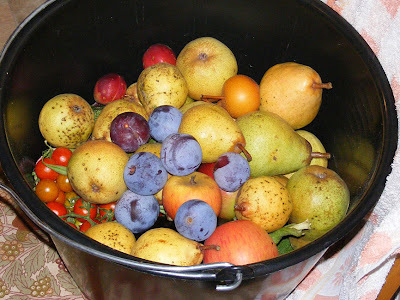 The fruit was large, extra tasty and extra sweet, but the small tree in the potager doubly so. We can't comment on the other trees; the big tree (which we commented on here) has suffered badly in the drought, and most of its fruit have stopped developing at the "hard as bullets" stage and gone on to the "shrivelled and falling off" stage. There are some fruit worth picking, and they're not bad at all. The last of the nectarine trees has only 3 fruit and is suffering likewise. 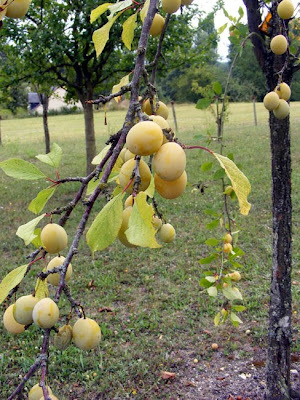 The plum trees have been a revelation - the yellow plums are Ste Catherine and never looked like ripening until the day, all of a sudden, when they were begging to be picked. They are quite small, and incredibly sweet and juicy, if not particularly tasty. The others are "prunier abrico rouge", a very large plum with red/purple skin and bright yellow flesh, and they are super tasty. The abrico rouge is a large tree, and so far we have half picked it, and picked up the windfalls. On Saturday evening we decided to give the Ste Catherine a shake, and all of its fruit fell off. 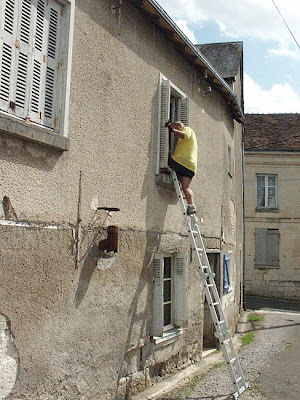 This is a lot easier than climbing a ladder! 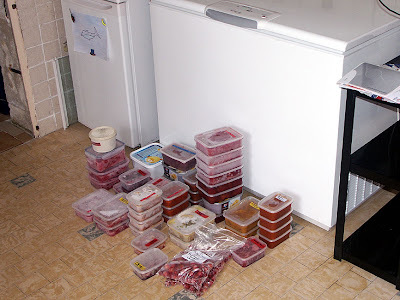 Once we have processed all of them (there's only about 4kg or so) and our freezer arrives (hopefully tomorrow!!) we will give the abrico rouge a shake. We went to the orchard this morning to give the tree a shake, even though it started raining (I will dignify the 8 drops of rain so far with that term in the hope it provokes a response). 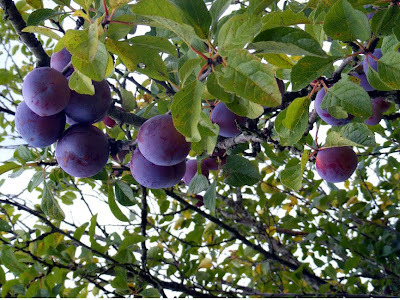 There weren't as many plum left as we thought, but at least we have taken all the plums of our trees. After the disappointment the last time we went to Nemours, we received an email from the garage we visited, apologising for the typo in their original email. We arranged to visit last Monday, ringing them up just to confirm they would be open. 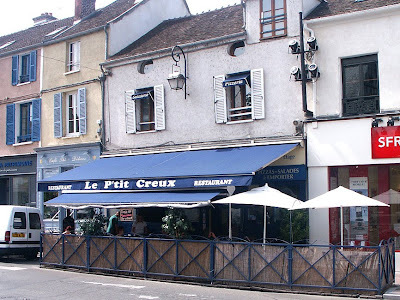 Nemours is a really pretty town, we assume fashionably close to Paris and in the Paris transport system, but without the Paris prices in the restaurants. We had a really pleasant lunch - steak and dessert - for 12 euros each, sitting outside a restaurant across from the church. There are some beautiful buildings in Nemours, and none is more attractive that the chateau. It looks like a fortified manor house should look - massive walls, but of quite moderate proportions. 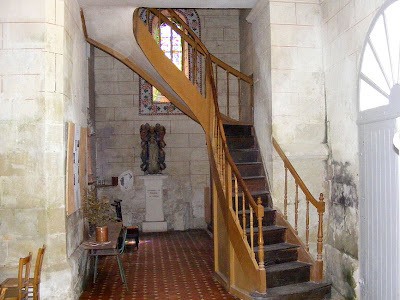 Some people may fantasise about living in a chateau like Chenonceaux, but if I had to live in a chateau this is the kind I would choose. There are a lot of parks and gardens in Nemours, and plenty of other open spaces like riverside and canalside walks. One of the riverbanks has metal sun loungers, a kiosk and an interesting children's playground. There are also a lot of dog toilet areas, but it appears the dogs in Nemours don't do readin'. Looking towards the chateau across the church garden. It looks like the municipal gardeners are hyperactive, because there are hanging baskets and planters everywhere, all in magnificent condition, and putting on a colourful show even though the last rain was 2 weeks ago. I am glad we aren't paying the water bill! The church and just a few flowers. 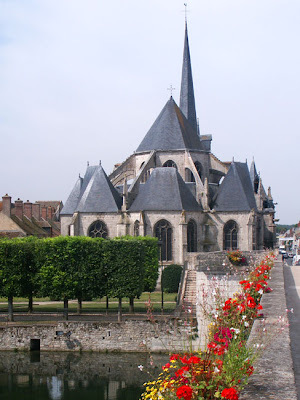 If you're in the area I think it is well worth a visit: Nemours has all those things you look for in a small French town - a chateau, and interesting church, good views, good restaurants, plenty of free parking and some interesting shops. It would be best not to visit on a Monday, because the chateau is closed. 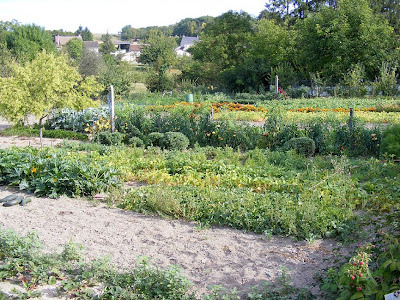 A potager in Preuilly is not self-consciously designed to be a decorative garden with some vegetable produce as an almost incidental bonus. 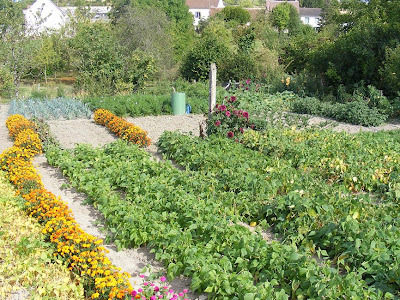 A potager is simply a vegetable garden, but for all that they have a certain style. 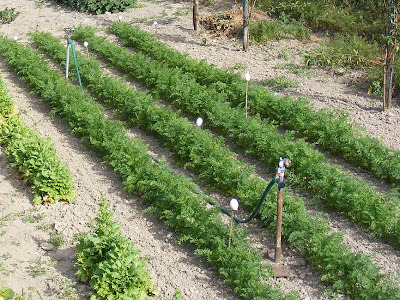 Plants are laid out in neatly tended rows. Flowers and fruit are almost always included, and the whole effect is pleasing to the eye, and a reflection of the diligent attention they get. They always give the impression the owner is feeding a family of about 20 with the quantity that is planted, but I think many people put in enough so that if they have some failures it's not a disaster, and everyone is very generous with offering their produce if they have surplus. At the moment, we are offering plums to everyone. The other day in return for some plums and beans I received about 20 little strawberry plants. 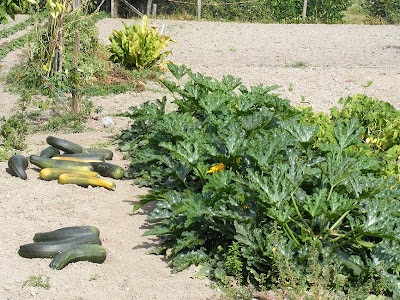 No one can give away their zucchini (courgettes) though, as everyone has surplus, even with this dry weather. The French eat vast quantities of lettuce of many varieties. 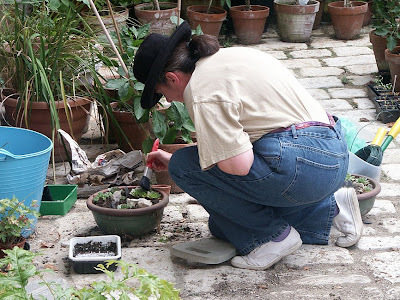 Whenever you are offered lettuce from a French person's garden, expect to receive at least two, as they assume you will eat that much lettuce within a couple of days. There certainly are some fairly hefty tomatoes (about 15 cm - 6 inches across) in Monsieur Q's garden, at least two different varieties. 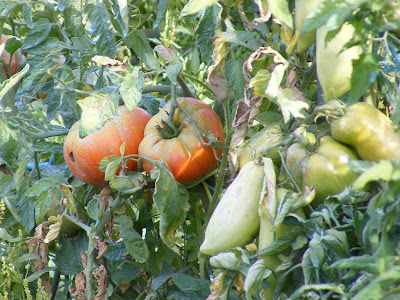 Note the powdery blue blotches of Bordeaux mixture (copper sulphate) in the picture below, used as a general fungicide, and in tomatoes used especially to try to control blight (Australians who have never encountered the blights that affect the solanum family of vegetables, think Irish potato famine for an idea of how devasting it can be). Always wash tomatoes before you prepare them in the kitchen in France, because they will almost always be treated with a fungicide. I also noticed eggshells on the tops of canes amongst the carrots. I had assumed this was protection against being stabbed in the eye when you bent over the carrots, but I don't know why only the carrots have eggshelled canes, or indeed, why there are canes in the carrot rows at all. It seems unlikely that it is a deterrent for carrot fly. Icecream is a favourite summer dessert in France, but even so, the French can't compete with the consumption levels of some other countries. More icecream is consumed in northern Europe than around the Mediterranean (with the exception of Italy). The biggest consumers in Europe are the Finns, at 13.3 litres per person per year. The biggest consumers in the world are the Americans, getting through an average of 0.5 litres per week per person. France comes in at 6 litres per person per year. France's very moderate performance in the icecream consumption stakes must be because two modestly sized scoops are considered a serving here, and icecream is a summer treat. Anyone seen eating icecream in the winter in France is clearly a tourist. As well as the industrially produced icecream available in the supermarkets, there are many small companies and individuals making glaces artisanales. The main difference between an industrial product and an artisan product comes with the quality of the raw materials. An artisanal icecream is made from fresh whole milk, organic eggs and local fruit picked at optimal maturity. Another difference is in the way they are made, especially in the amount of air incorporated into the mix. Industrial icecreams have a lot of air in order to add volume. Front, glace à la vanille and sorbet à la framboise. Glace – contains water, milk proteins and fats. Sorbet – a mixture of water, sugar and at least 25% fruit. Crème glacée – made from milk, crème fraîche (cultured fresh cream) and sugar. 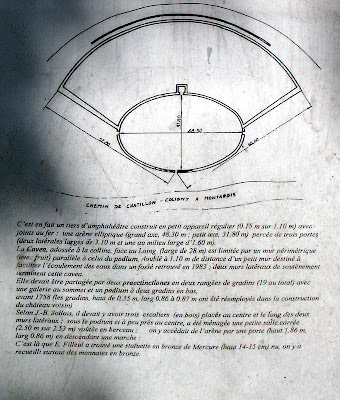 A scoop of icecream is called a boule in French (think pétanque), not to be confused with the bowl it comes in, which is a coupe. French icecreams do not have flavours, they have parfums. One of the nicest things about icecream in France is that if you opt to have it in a cone, the cone will be one of those crisp crunchy wafer cones, not a nasty piece of moulded cardboard (or whatever completely unispiring substance those icecream cones are made of). 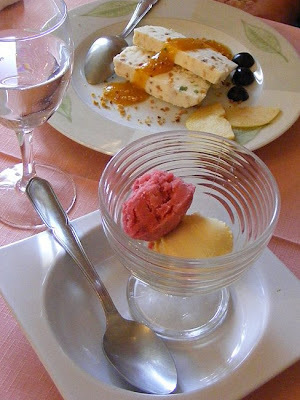 The most famous glacier - sorbetière in France is Berthillon, based on the Ile de Saint Louis in Paris, but there are many other excellent artisan producers. David Lebovitz has a useful list of the Paris based ones here. *Photograph taken at l'Image in Preuilly. Les glaces are the one thing on the menu that is not made in house here, which is perhaps a measure of how specialised a skill it is seen to be. Note that it is not seen as necessary to bulk the dish up with disgusting squirty cream or cheap syrupy topping. 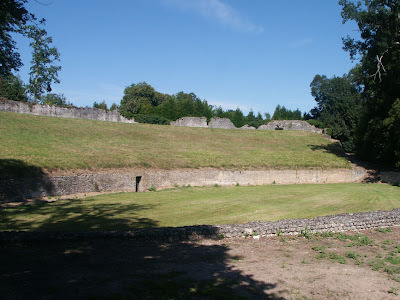 Between Montargis and Châtillon-Coligny there is a really impressive Roman theatre (I have marked it here). We drove past in on one of our expeditions looking at cars. Every time we go out in the car we see signs pointing to really interesting things we never knew existed. In a way, this is a bonus: we wouldn't travel 300km just to see this Roman amphitheatre, but having it appear out of the blue provides an opportunity to stop the car and have a little walk. If it isn't Roman remains or an abbey it's a prehistoric monument or interesting and unusual church. We never know quite what we are going to stumble upon, but we are always ready to dive down a side road or head up a grassy track just in case there is something remarkable at the end. 2009 has not only been the hottest summer since we have owned the house in Preuilly, it has been by far and away the driest, too. Today once again it was over 30°C, and once again it is thought it might rain the day after tomorrow. This has been the forecast for the last two weeks - dry and hot tomorrow, rain the day after. They've been right about tomorrow - but the day after tomorrow never comes and we just get tomorrow again. Today and tomorrow the forecast is for 34°, Friday's forecast is for cooler with a chance of rain. This means we are still carrying water down to the garden. 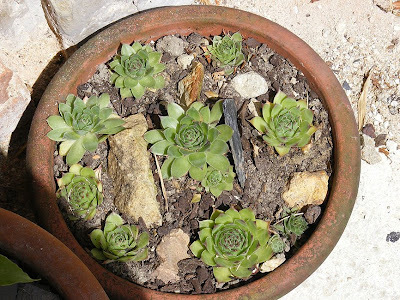 Of course, we can never carry enough water to the garden to water properly, but we are amazed that the plants are hanging on in there, even if they aren't growing. The leeks are looking as if they might last, but at some stage we will have to water them even though so far we have managed to avoid it. The beans are having a hiatus, but have lots of little pods - we assume waiting for the rain before they overwhelm us. We hope so anyway, though at the moment the overwhelming is being done by plums and we have nowhere to store them: the freezer is full, the fridge is full, and the second small bar fridge is full as well. We have had a freeezer on order since the end of last month and are expecting it sometime this week - or maybe next week. This will really allow us to make the most of our produce, and also to take advantage of any specials and bulk buys at the market and supermarkets. We debated if buying and running a freezer is economically worthwhile, but freezers have come a long way since we last had one, and the new freezer will use less than one unit of electricity a day making for an increase in the electricity bill of about 25€ a year. If we can make the most of our garden produce we should get a net saving in money terms - and a net increase in our confidence in the freshness and quality of the food we are eating. Susan and I have often joked about becoming vergetarians, but even in the unlikely event of that happening I doubt if we will ever do this, even though it is the authentic French way of gaining extra protein. 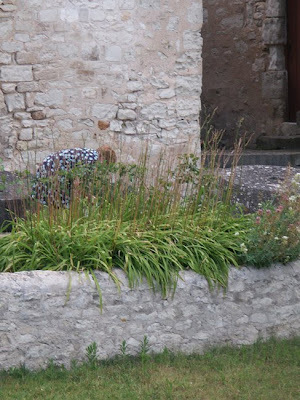 Gathering escargots from the chateau walls. A short movie, just to show how many Traction Avants were on display at EuroCitro 2009. We were surprised to see a whole carpark full of cars in all conditions from regularly used and unrestored with a spot of rust, to pristine concours condition. A carpark full of Traction Avants. Today we are off looking at a couple more cars. Another day on the road, another 600km: more new scenery, and with any luck another roadside restaurant. We left at 7.00am this morning, and expect to be back in time for a late dinner. 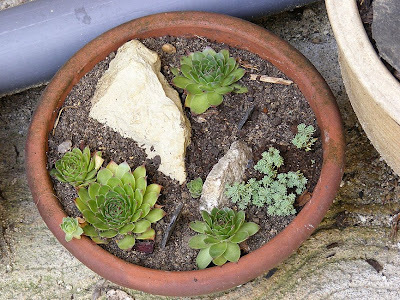 In other news: It still hasn't rained since last time (10 days, nary a drop), I have made progress painting stuff around the house, and the courgette plants have gone barmy. The stream near the garden is totally dry, but the plum tree is producing fruit like fury. It was 29°C at 9.00 last night, which is well over 80° in the old money. When I was a boy, one of my favorite books was "Speed Six" by Bruce Carter, about a bunch of chaps (there is no other word for them) who take a 1930s Bentley to Le Mans in the 1960s - and blow me down, they win!!! 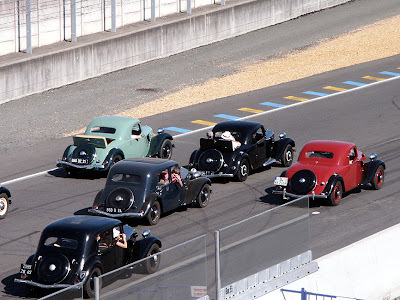 3 Traction Avant Faux Cabriolets lead the pack down the straight. I am not a huge motor racing fan, but the book caught my imagination and has stayed with me ever since. 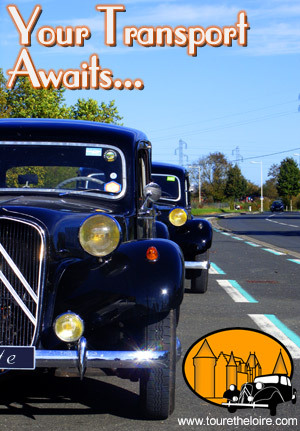 Words like Arnage and Mulsanne excite me - little did I know they they are the names of villages that the Rolls-Royce and Bentley company named their cars after - I thought the various corners and straights were named after the cars. Yesterday I drove down Mulsanne Straight. I will repeat that, because it is essential you realise how important it is. I drove down Mulsanne Straight. 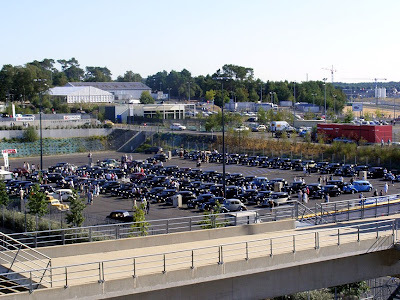 Other things we did yesterday was look at hundreds of Traction Avants at EuroCitro's 90th birthday of Citroën big bash. 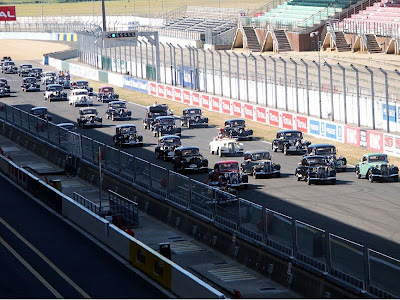 If we had bought a car last month, registered and spent three days camping at Le Mans (which I have to say looks rather fun) we could have driven around the Bugatti Circuit, which includes part of the 24 Hour track. 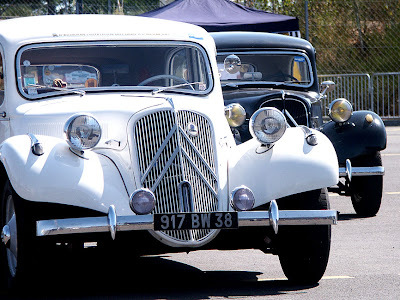 We have hundreds of photos of Citroëns, and we have just shown a random collection here. We are both extremely tired but it doesn't matter. Because today I drove down Mulsanne Straight. Ratatouille (pronounced rhuh-tuh-too-ee) is the quintessential southern French late summer vegetable stew. 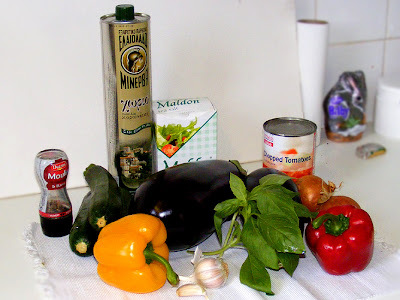 It uses all the vegetables that one hopefully has a glut of by the end of August – aubergines (eggplant), zucchini (courgettes), onions, sweet peppers (capsicum) and tomatoes (pronounced tom-AH-tohz, I think you'll find...) and seasoned with garlic and basil. Simon eats almost nothing else when he is on his own in September. There are lots of fussy recipes which instruct you to cook all of the vegetables separately and only mingle them at the end. Who can be bothered washing up 4 saucepans instead of just one, for goodness sake! 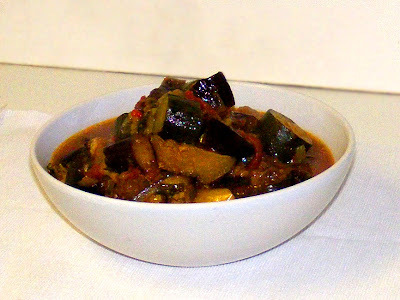 The trick is to cut the vegetables into big chunks eg the aubergines should be quartered lengthwise and cut into 2 cm slices crosswise; the peppers into 4-5 cm squares; the zucchini into 3 cm crosswise slices. That way they will all retain their individuality and not turn into pulp. Ken posted a comment yesterday asking about the difference between UK and French paint, saying that he had heard that paint sold in the UK is much higher quality. I have heard and read the same thing said. You see paint being sold in all sorts of places in the UK; from cheap paint in supermarkets, to boutiques purveying the expensive (and too trendy for my tastes, no matter how good it is) Farrow and Ball paints, and a whole range in between. I would hazard a guess that Tesco's home brand paint isn't terribly high quality and isn't the paint the people Ken refers to are talking about. I painted the blue shutter in June 2007. It is still as good as new. Having never bought paint in the UK, I find it hard to say for sure; but athough I have never painted houses in the UK, I have painted houses in Australia and the paint in France acted like I expected paint to act. Susan says she can't relate to the argument that French paint is thinner than UK paint, either, and (as ever) I have a theory about that. 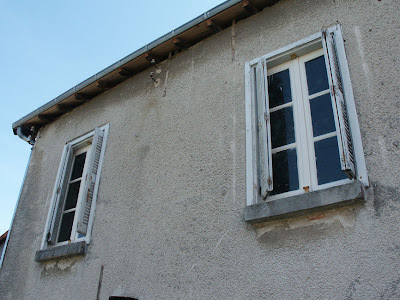 Maybe UK residents who also own a house in France have never painted their UK house in 35°C heat, the sort of temperature where paint gets runnier. 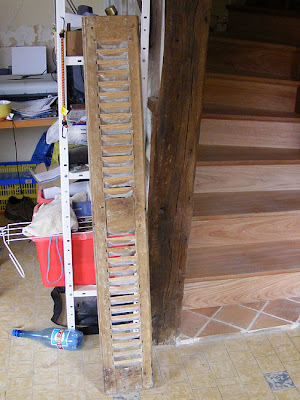 French paint is too thick to use when the temperature is only 12°C, as I discovered last year. Or it may be that French paint is fourmulated differently because it has to cope with more sun, more snow, and less rain. At 8.00am the paint was so thick it would hardly come out of the can. I have no issues with French paint - but it does give a different look to UK paint - a more powdery finish, which I actually quite like. That could be because the paint I have seen used in the UK is super high gloss, and in France the norm is to choses a satiné or mat finish. 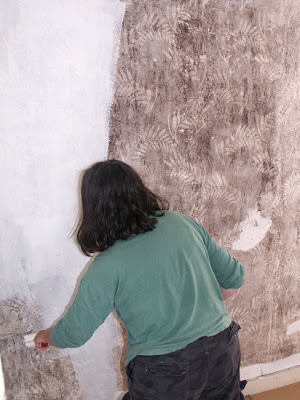 Yesterday's blog had a photo of Susan painting the wall of our guest bedroom. This was so successful that we have decided to paint the main bedroom as well: these are only temporary measures because the rooms need insulating and panelling, but it will make the rooms nicer to use in the meantime. The paint we are using for the plaster walls is Brico-Depot super cheap acrylic matt white paint, €5.65 for 10 litres. The effect is startling - a nice chalky pure white finish where before we had stains left by mould. Interestingly, the mold was under the wallpaper and only grew where the background colour was, leaving us with a stain in the fern leaf pattern of whatever wallpaper was up when the roof in that room was leaking. 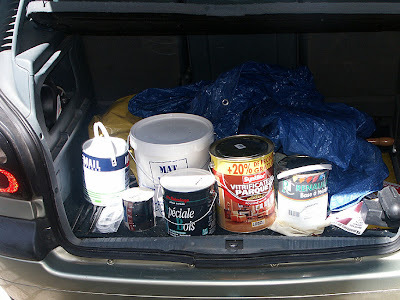 now we have bought a bootload of paint. 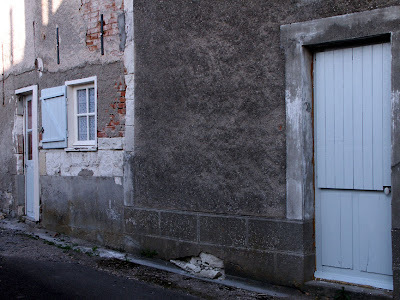 We originally went out today to buy more undercoat for the shutters I am renovating, and a can of the bluey-grey colour we have decided on as the final colour. BricoMarche in Yzeures didn't have the colour we were after, but were offering to tint a can of paint to the right shade. The problem I had with that concept was the fact the 2.5 litre can of paint base was almost €90, with €6 euro for each colour of tint added - and €10 for the processing. This struck me as a bit rich (reference yesterdays post for the sort of thing I was thinking) and we made the executive decision to visit BricoDepot in Dissay instead. That was a much more successful expedition - we bought another 10 litres of super cheapo so we can do the main bedroom, 2.5 litres of microporus undercoat for the shutters, 6 litres of polyurethane for the staircase and 2.5litres of tinted just for us blue-grey for the shutters. Total damage? Just over €120. That still is a bit of a shock, but a lot better that €112 for 2.5 litres! On the way back we had lunch on the terrace at Le Relais du Clain, a bar-restaurant in Beaumont on the D910 and had a huge salad and dessert and a small pitcher of charentais rosé. As we have come to expect from this kind of place, the service was friendly, the food was well prepared and imaginative - and it was all very reasonably price, at €27 for two people. To celebrate spending all that money I decided to put the paint (or at least the undercoat) to good use and give the shutters their first coat. 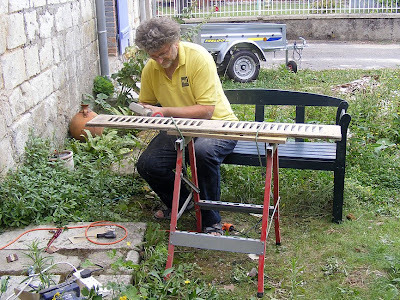 Painting louvres is a thoroughly annoying job; not as hard work as sanding , but difficult and messy. At least I managed to hang them up so I could actually get to both sides. 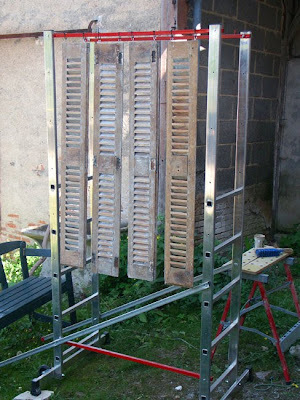 I considered myself to be on a roll, so I gave the window frame its first undercoat as well. After dinner we walked to the orchard and did some picking - a couple of kilos of plums, assorted tomatoes, beans and courgettes, and best of all - my hot chilies are turning red. Well, now we've covered les politesses in previous posts, let's move on the the real reason it's fun to learn a foreign language. It's because you want to know the rude words, bien sûr. The first rude word that everyone learns in French is merde. 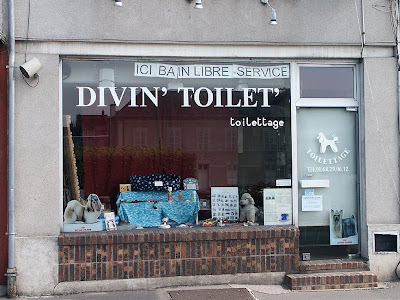 It's so well-known that you probably encountered in your High School French textbook, and disappointingly, it's just not that rude in France. Everybody, including our 90+ year old neighbour uses it (when she drops her walking stick), although nicely brought up people do disapprove of its indiscriminate use in every conversation. 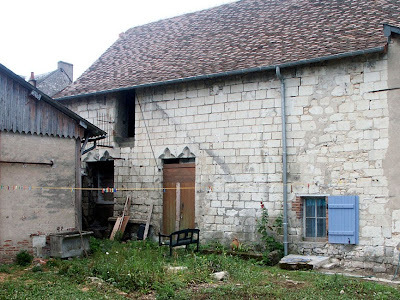 Stone Mason: Nous avons besoin du dictionnaire ! If you are worried that merde and zut might be too impolite for the company you are in, but you need an expletive, you can use mince ! (pronounced more like 'manse'). It actually means 'slender', but can be used the same way that in English one substitutes 'sugar' for a 'harder' word. In the drought you mean? Our house came with an assortment of shutters. 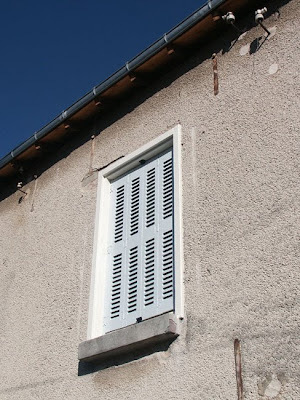 One is metal, the others are oak with a fixed louvre arrangement in pine so they admit a breeze and a little light (many people have their windows open, but the shutters closed in hot or humid weather). Some of them fold back on themselves to sit inside the window surround, some of them fold back to sit flat against the wall either side of the window and we get to use the charming 19th century metal ladies who fold up to hold the shutters in place. The wooden ones are tatty and falling apart and in desperate need of painting. We have guests arriving in September, and we want to paint the guest bedroom to make it more pleasant for them. Painting the walls makes more sense if you paint the internal window frames as well, and as they're attached to the window frame outside which are attached to the shutters.. it makes sense to do the whole lot. Adrian escaping during the "Big Bath Incident of 2008"
which is bungee corded(ocky strapped) to a sawhorse. presence of the AGI T-shirt - this is serious stuff. Three days into the job, and he has sanded back the window frame inside and out, and sanded off the two halves of one shutter. The paint is flaking in places, but mostly is as hard as iron (it's probably lead based paint). The corners of the louvre slats are an added challenge, being awkward (almost impossible) to get at. He's resorted to being fairly brutal and is using a circular nylon brush on the end of the drill followed by a metal file. Anything that survives that treatment is then dosed with paint stripper and scraped. It is nasty dusty work, with some health risks due to the lead in the paint (which can be mitigated somewhat by damping everything down). On top of that, Simon has bursitis in his left elbow at the moment and holding anything or just moving his arm is painful. As it happens, I have bursitis in my right elbow, so he needn't worry that I'm having any more fun than he is. the gaps at the ends of the slats filled up. Looking at their flaking paint, bent rusting hinges and eccentric hanging arrangement, I had assumed that we would have to replace them and I'm really surprised at how good their condition turns out to be, and how well made they are. Despite the discomfort he's doing a really careful, thorough job on them, and I am confident the shutters will look as lovely as the windows he did a couple of years ago.